This story outlines the search for the origins of Charles Harris. In about 2009 I started researching the family of my wife’s father. Her father knew his grandfather was Alfred Harris from Pateena who had over 20 children, most of whom he could name. Nothing was known beyond that. I found that Alfred was born in Westbury in 1864, the sixth child of Charles Harris and Isabella Murray. The Murray story is a fascinating one. Isabella’s father was part of a large group of connected Scottish pioneers, many of whom took up original land grants around Campbell Town in the 1820s and played a key part in the early colonisation of Van Diemen’s Land and later Colac in Victoria. I established that Charles was born around 1824 from his death certificate but the first trace I could find of him was when he was aged about 28 and farming at Great Swanport (Swansea) in 1852. He was literate, later successful in business and apparently ready to use the law to protect his interests. He worked originally as a farmer, then storekeeper, entrepreneur and finally commission agent. In one legal document he described himself as a gentleman. Exhaustive attempts to trace him prior to 1852 failed. I explored and traced every relevant Harris in all the major repositories including the Pioneer Index and TAHO convict records and I eventually eliminated each of them. 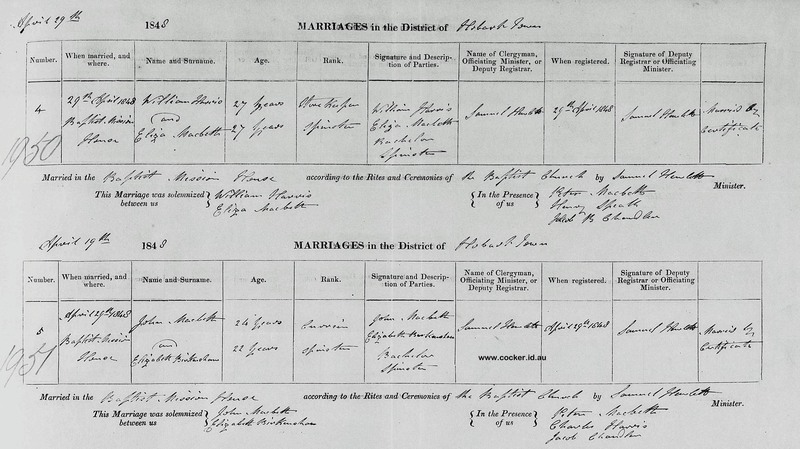 Brother and sister John and Eliza Macbeth had a double wedding in Hobart on 29 April 1848. The Macbeth family arrived as cabin passengers on the Eveline in 1834. Also on-board in steerage were Mr & Mrs Harris and four children; this may be coincidence. The two marriages show Charles and William were connected closely enough to be witnesses at each other’s weddings at opposite ends of the state and five years apart. Charles was married just 6 weeks after the death of William’s daughter Roberta. They both moved from Hobart to the relatively remote Swanport around the same time. Having failed to find any conclusive trace of Charles prior to 1852 my search for Charles Harris then focussed on William in the hope that it would lead to William’s and hence Charles’ origins. William married Eliza Macbeth, daughter of Peter Macbeth and Mary Crossland, on 29 Apr 1848 in Hobart, Tasmania. Both were aged 27. Eliza was born on 12 Apr 1821 in London, England. The full genealogy is told here. In 1849, when William and Elisa’s first child, William Louis, was born they were living in Harrington Street, Hobart and he gave his profession as storekeeper but by 1850 he was a Swansea storekeeper and later also postmaster. I sought assistance from the Glamorgan Historical Society. A William and Eliza Harris had died (separately) in Hobart in the early 1900s and I initially accepted (incorrectly as it turns out, but like many other researchers) that this was “my William” while I continued to look for evidence. I was sceptical of the records (Colonial Family Links and Pioneer Index) which showed a Harry Harris being born to William and Eliza in 1851. Unusually, I had found no trace of any of their children since their births. 1. William Louis Harris was born on 29 Sep 1849 in Hobart, Tasmania. He died before 1904. 2. Charles Arthur Harris was born (no record found) about January 1850 and died of scarlet fever on 10 May 1853 in Great Swanport, Tasmania. 3. Eliza Harris was born on 15 Nov 1850 in Spring Bay, Tasmania. 4. Marion Ellen Harris was born on 19 Dec 1851 in Great Swanport, Tasmania, and died of scarlet fever on 19 May 1853 in Great Swanport, Tasmania. 5. Roberta Harris was born on 5 Dec 1852, was christened on 5 Dec 1852 in All Saints Anglican, Swansea, Tasmania, and died on 5 or 6 Dec 1852 in Swansea, Tasmania. William and Eliza were storekeepers and postmaster in Shaw’s Building in Franklin Street built for and owned by Edward Shaw. This pre-dates the better known Morris’ store which is opposite. In early 1853 ex-convict John Webster took over the lease and bought William’s stock. Their departure appears to have coincided with the deaths of two of their four remaining children to scarlet fever. Progress escalated when I found that Victorian records existed for William. Death records in Victoria are much richer than Tasmanian records and the purchase of many Victorian marriage and death certificates revealed that William had moved to Geelong in 1853 where he had a further three wives and seven children and worked for many years as the Town Clerk in Geelong. There are quite rich records including photos and I was able to make contact with some descendants. Unfortunately they were not aware of William’s origins and could not help with Charles. Eliza Harris died in 1863 and William’s second wife, in 1864, was Mary Chandler. She was the sister of Jacob Chandler who married two of Mary’s sisters and was witness at William and Eliza’s wedding. Jacob founded the famous Chandlers shipyards at Battery Point. William and Mary had two children, Mary Ruth and Ebenezer Cyrus. Mary Ruth married William Thomas McCure in 1891. Mary Harris, nee Chandler, died in 1880 and William’s third wife, in 1881, was Ann Elizabeth McCure, no children. Ann died in 1889 and William’s fourth wife, in 1890, was Hannah Woolard, no children. On his death certificate William’s parents were given as Thomas and Louisa and his birth place as Deptford, Kent. I have traced Thomas and Louisa and found that Thomas and Louisa’s first child, Thomas William Harris, also emigrated to Tasmania. He married Caroline Sadler at St Johns Church New Town in 1849 and moved to Geelong. Thomas’ given rank was gentleman. The Sadler family arrived in Van Diemen’s Land on the John Craig in 1832. 1-Thomas William Harris, son of James Harris and Elizabeth Sheldrick, was born in 1795 in Greenwich, Kent, England, was christened on 6 Mar 1795 in Chatham, Kent, England, and died in Oct 1873 in Romford, Essex, England at age 78. Thomas married Louisa Lawrence on 8 Jun 1817 in Saint Giles, Camberwell, Surrey, England. Louisa was born about 1799 in Starston, Norfolk, England and died in Apr 1879 in Romford, Essex, England aged about 80. Thomas was a grocer. They had four children: Thomas William, William Benjamin, Benjamin and Louisa. 2-Thomas William Harris was born on 4 May 1818 in Kent, was christened on 31 May 1818 in Saint Paul, Deptford, Kent, England, died in 1904 in Victoria, Australia at age 86, and was buried in Eastern Cemetery. Thomas married Caroline Sadler, daughter of James Sadler and Elizabeth Maton, on 26 Feb 1849 in St Johns Church New Town. 2-William Benjamin Harris was born on 8 Apr 1821 in Deptford, Kent, England, was christened on 29 Apr 1821 in Saint Paul, Deptford, Kent, England, died on 22 Feb 1904 at his residence, 49 Weller St, Geelong West, Victoria at age 82, and was buried in Geelong Western Public Cemetery. William married Eliza Macbeth, daughter of Peter Macbeth and Mary Ann Presland, on 29 Apr 1848 in Hobart, Tasmania. 2-Benjamin Harris was born on 8 Jul 1823 in Kent, England and was christened on 3 Aug 1823 in Saint Paul, Deptford, Kent, England. No further trace of Benjamin can be found. 2-Louisa Harris was christened on 18 Jan 1825 in Deptford, Kent, England and was buried on 26 Jan 1825 in Saint Paul, Deptford, Kent, England. It seems likely that all three Harris’ (Charles, William and Thomas) arrived together, or in close succession, in Van Diemen’s Land in the mid to late 1840’s. I have not succeeded in identifying their arrival, although there are several possibilities. Although Thomas, William and Charles all described themselves as gentlemen, their father signed his marriage register with his mark, i.e. was presumably illiterate, (Louisa signed her name) and William’s death certificate and various censuses describes his father as a grocer. At this stage there was evidence that Charles and William were at least close acquaintances but no evidence of an actual relationship. The birth record of Benjamin Harris on 8 Jul 1823 made it difficult to place Charles in that family if he was indeed 65 at the time of his death in 1889. Thomas William and William Benjamin both settled in the Geelong area as did some of Charles’ descendants and there is some secondary evidence that William’s descendants were at least known to each other. I made contact with some of William’s descendants and I was convinced the answer to the riddle lay in Geelong and then in 2015 I made contact with a Mrs Harris in Geelong who had communicated with a fellow Murray researcher some 15 years earlier. Her late husband was grandson of Thomas Carmichael Harris, the youngest son of Charles and Isabella. He died in 1998 and, although she was in the process of moving from her family home, she kindly sent me an extract of a Harris history that her husband had written. He made very similar findings and came to very similar conclusions to me but I learnt several key new facts. 1. His grandfather Thomas Carmichael Harris was known as the nephew of William Harris (Town Clerk of Geelong). This implied that Charles and William were brothers but he also failed a birth or baptism record for Charles. 2. Thomas William Harris and family moved from Hobart to Geelong in 1852 and opened an ironmonger shop in Moorabool Street. 3. The two first born sons of Charles and Isabella attended Horton College at Ross. This Wesleyan College was then perhaps the most prestigious private school in Australia and this reinforces his social standing. The second son, Leonard Montague went to New Zealand and then Durban, South Africa where he established wholesale trading companies, reinforcing the family grocery connection. 4. The history also documents the donation of a photo of Charles and Isabella to be hung in the White House which eventually led me to the Westbury Historical Society where I found the photo and a portable organ purchased by Isabella on display. 5. Youngest son Thomas Carmichael travelled to Victoria in 1884 and for a time worked as a jackeroo on properties in Queensland. At the time of his marriage in 1890, to Laura Annie Shirley, his occupation was stated as 'Grocer' of Broadford, Victoria. A witness at the marriage of Thomas and Laura was a Florence B. Harris. Florence Burns is a daughter of William Benjamin (Town Clerk) and Eliza (nee Macbeth) Harris. In the 1880's Florence was listed as a property owner in the Broadford district. The grocery business of Thomas at Broadford was not a financial success, and Thomas and Laura remained in Geelong where he worked as a clerk. Laura Ann Shirley’s mother was the third wife of William Harris in Geelong. (Laura was born to her mother's first husband, Richard Shirley). This provides confirmation that the strong relationship between William and Charles continued down through their descendants. This additional information also strengthens the ‘grocery’ connection across Thomas William Harris and his sons Thomas and William and Charles Harris and it provides secondary evidence that Charles was indeed a brother to William. All of the descendants of Thomas and Louisa can be traced to primary records except there is no trace of Benjamin Harris after his christening and there is no record of the birth/christening of Charles. Benjamin was born within the same 12 month window that Charles was born. I have re-examined all of the facts and applied Occam’s razor which, in effect, states that the simplest solution should be selected. Both the anomalies are explained if Charles was born and baptised as Benjamin and later adopted the name Charles. Indeed all of the available evidence is satisfied by this possibility and there is no evidence that conflicts with it. His older brother was baptised William Benjamin and perhaps Charles disliked being referred to as Benjamin. Somewhat supporting this conclusion is the fact that William also dropped the name Benjamin. Despite being christened William Benjamin Harris, he dropped his second name and in all official records after his arrival in Van Diemen’s Land he gave his full name as simply William Harris. William named his first son William and his second son Charles. Charles Harris was born on 8 July 1823 at Deptford St Paul, Kent, England to grocer Thomas William Harris and his wife Louisa nee Lawrence and was baptised on 3 August 1823 as Benjamin Harris. He was commonly known as, or later adopted the name, Charles Harris. It seems unlikely that any further birth/baptism records will be discovered. The census records give us the address of Thomas and Louisa and local English research may provide new clues. The census records tell us that Thomas and Louisa lived with their nephew, William T. Harris and later known as Thomas Harris, who worked in their shop from at least 1851 when he was aged about 21 to 1871. Thomas and Louisa had died by the 1881 census, by which time the records tell us that nephew Thomas was still single and head of the house with two nephews, Robert and Joseph Bailey as assistant and butcher respectively. It may be possible to use this data to expand the family records and find new connections. A family record of the date Charles celebrated his birthday would provide confirmation. One member of the Westbury Historical Society lives in a Heritage listed house once owned by Charles Harris and that body is investigating whether it can add any further information. Ultimately DNA analysis may provide a definitive answer. The Murray Clan DNA Research Project Group is well documented on Facebook.